Live Law : Let us start with an issue being talked about at the Bar now and we are happy to notice that you have commented on the story we have carried on Dushyant Dave's letter to the CJI. We have been told by the Senior Lawyers that the order passed Justice CK Prasad is not justifiable in law. Do you think the judgment and order pronounced on 25.02.2014 was illegal, coram non judice and violative of basic principles of exercise of judicial power and liable to recalled forthwith? Live Law: Justice V.R.Krishna Iyer and Justice K.T.Thomas had written to the Chief Justice demanding action on the allegations leveled by Dushyan Dave. It seems the CJI has not responded to the letters so far. What action CJI can take in on such matters? Kamini Jaiswal : It is unfortunate that the court has glossed over such a serious issue that strikes at the root of the system and continues to be followed in other cases. The Court talks of an internal mechanism the least that could have been done is to have the matter investigated and action taken against those found guilty and colluding. Live Law :We have noticed that the so-called leaders of in Supreme Court, barring a few, silent on this issue. The Bombay lawyers Association had sent a memorandum signed by 100 members of the to the CJI, but even after repeated request the Supreme Court Bar Association has not responded to this issue. What could be the reasons? Kamini Jaiswal : When the Bar has taken up an issue like this that we should expect it to react? They are only meant to organize lunches and dinners like any other club. Live Law: What is the status of Committee for judicial accountability? Why the Committee is not responding to the present issues? Kamini Jaiswal : Yes, it is there, but unfortunately has been dormant as most of the founder members have gone away and there is not even a handful left to carry it forward. Live Law: There is a general perception among the members of the Bar that senior members of the Bar are very silent or compliant on many critical issues touching the independence and integrity of judiciary as a whole. What is Your take on this? Kamini Jaiswal : They like an ostrich existence those that think about it, most people are only bothered as to how many matters that they do every day and how much relief they are able to get for their respective clients from the judges. The health of the Institution that makes it possible seems to be the least of their concerns. Live Law: In 2010, a bench of justices Markandey Katju and Gyan Sudha Mishra observed “Something is rotten in the State of Denmark, said Shakespeare in Hamlet, and it can similarly be said that something is rotten in the Allahabad High Court," and the high court "really needs some house cleaning. Do you think something is rotten in the Supreme Court? Kamini Jaiswal : The Judge who made this remark should have looked within the less said the better. Live Law: What, actually mean by forum shopping or bench hunting in the context of present day legal practice? Are the lawyers not main culprits in these sorts of affairs? Kamini Jaiswal : If Lawyers did not ignore, encourage or participate it would not be possible. Live Law: Coming into the question of recent controversy and allegations raised against Justice Ganguly and Justice Swatanter Kumar, do you think that both cases are treated differently? In Justice Ganguly’s case the CJI immediately formed a committee to inquire into the matter, but it was not happened in Justice Kumar ‘Case. Kamini Jaiswal : That is why they say the closer you are to in Delhi the more powerful you are. Have you any idea as to the Stalwarts who come to the aid of the latter. Live Law: What do you think about the recommendations of Senior Advocates Fali Nariman and PP Rao on inquiry in to the sexual harassment allegations against Judges? Many lady lawyers have pointed out that they have suffered at the instance of their seniors. How can we address this issue effectively? Live Law:According to Amnesty International’s Annual Review of Death Penalty worldwide 2013, which is released this week, states that India’s only execution in 2013 (Afzal Guru) violated international standards”. Do you think Afzal was hanged for mere political gain? Kamini Jaiswal : Is there a doubt about it ?. He was hanged in a most disgusting manner in violation of all norms, national, human and international in an attempt to deprive the blood thirsty BJP of a political plank. Live Law: In a landmark Judgment in ShatrughanChauhan v. Union of India, the Supreme Court held that delay in execution is a ground for commuting the death sentence and issued many directions relating to the execution of death sentence. Almost all these directions were violated in Afzal Case. Do you feel that theSupreme Court failed to be pro active in the case of Afzal Guru? Kamini Jaiswal : Every institution failed in Afzal,s case when you hang somebody to satisfy the collective conscience of the people of the country. Live Law : The Lokpal selection process is under challenge before the Supreme Court. As per the reports many sitting Judges have applied for the post. What do you think? Kamini Jaiswal : We talk so much about the independence of the Judiciary, is it not compromised members of the selection panel, and the search committee appear before them day in and day out. Live Law : Coming to back to practice, we have noticed that many lawyers, who are far more juniors to you are designated as Senior lawyers by the Supreme Court, still Prashant Bhushan and you are not. Do you think that our system of designation of senior lawyers is faulty? Kamini Jaiswal : Speaking for myself it doesn’t bother me one bit, there is a lot to say about designations but it is irrelevant in the scheme of things.If you want a job you apply for it, if you don’t need it you will not apply we do not need it. Live Law: Do you think there is a general aversion towards activist lawyers by judiciary? 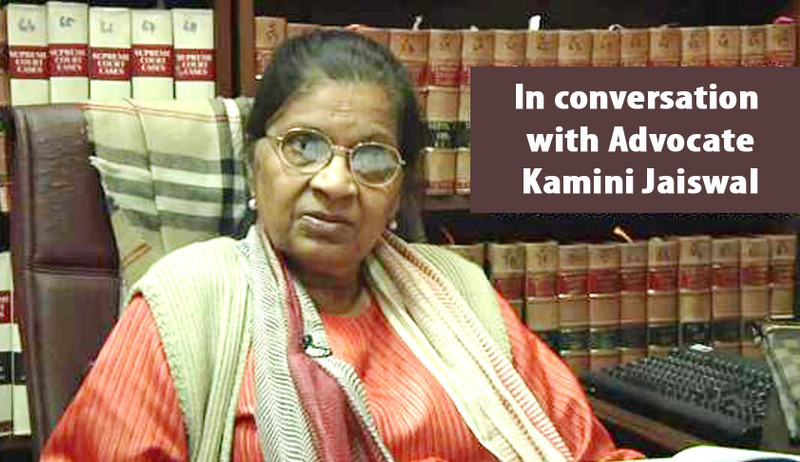 Kamini Jaiswal : There is no doubt about it, who likes plain speak, or to be questioned ? Live Law : Have you ever aspired to be a Judge? Kamini Jaiswal : I won’t even be considered. According to them I don’t know the Law and I definitely don’t know the Judges and the Law Minister. Live Law: What is your message to young members of the Bar? Kamini Jaiswal : Don’t treat the profession as an industry where you are there only to make money. Money will come your way even if you practice honestly and truthfully. Maybe you cannot afford a house in Jor Bag, Sundar Nagar or in every country across the globe but at the end of the day don’t sell your conscience which is the most precious attribute. There is no substitute for hard work.